Support the Guild. Become a Member Today! Celebrating 50 years, The Guild of Artists & Artisans (The Guild) seeks to build upon its strong legacy, by creating an exciting fundraising initiative to lay the foundation for a successful second half of a century! Supporting independent artists since 1970, The Guild of Artists and Artisans, founded for and run by artists, continues to be an artist driven membership organization that develops and presents high quality art fairs that provide marketing opportunities for its members and also serve as educational, cultural and entertaining events for the community. Since its inception with the founding of the Free Arts Festival, now known as the award-winning Ann Arbor Summer Art Fair, The Guild connects artist entrepreneurs to the community through art fairs that create the perfect environment for them to showcase and sell their work throughout the year. At Guild events, the artists are the focus of the event with food, live music, and art activities to help enrich the experience for fairgoers of all ages. These events enhance the communities where they take place offering an opportunity to see, participate and learn about art in fun and exciting spaces. Realizing how personal art buying is, The Guild connects artists to the community allowing artists to make a living doing what they love. Your support to The Guild not only benefits professional artists but further extends to contribute to the growth of young artists through The Guild’s art activity areas at each fair and Emerging Artist program. Your money will go toward general operations support, without a doubt the most important support we can receive, as it helps to fortify The Guild while allowing our mission work to thrive. An investment in the Guild is an investment in independent artists, the quality of life of your community, and shows your support for the future of the creative economy. 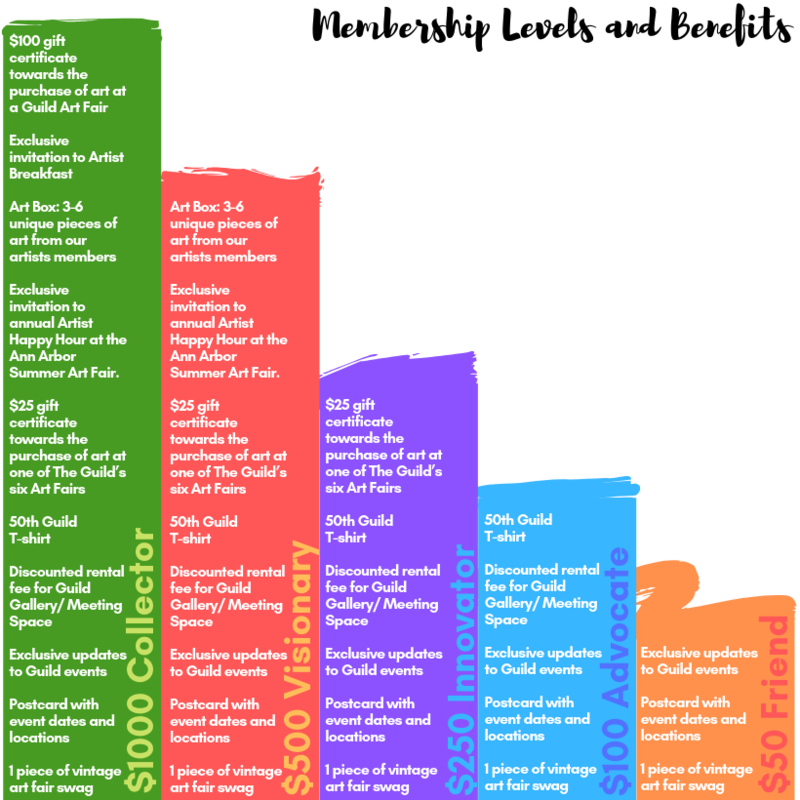 Become a Member or Donate to The Guild today! If you select Recurring, we will automatically process the form of payment used today to process future donations. Email is a required field so that we can send you an acknowledgement letter for tax purposes. We will not share your email with anyone. Sign me up to receive updates and emails regarding Guild events! Please note: once you click "Submit" below, you will be redirected to PayPal for payment. To pay via credit card, hit submit and then scroll to the bottom of the page and select the "Pay with Debit or Credit Card" button.